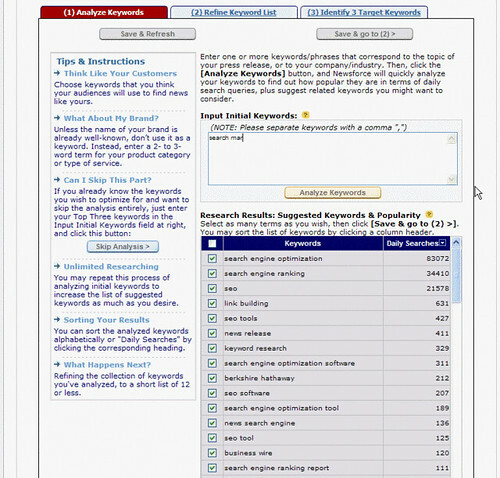 A new set of tools for press release optimization was announced today called Newsforce. The toolset is a combined effort of SEO-PR, SiteLab International and Primero Systems. Newsforce has partnered with Business Wire to offer the press release optimization tools to Business Wire members. The tool allows redundant tasks to become more efficient and is intended to allow anyone that is not savvy technically to research keywords, analyze a press release and add links. It also allows the release to be exported directly to your Business Wire account or as a text document. The NewsForce tools I saw demonstrated were very much like the Web Position Gold page analyzer tools we used to use in the late nineties for web page optimization, except it is specifically for press releases. The toolset could also be used for article optimization. Business Wire NewsTrak will provide the tracking component. The cost for use of the tool is estimated to be about $200 per release. 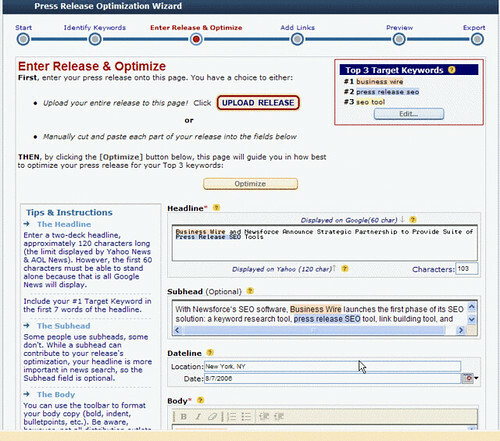 SEO tools for press release optimzation were also launched by PRWeb at the end of June called SEO Wizard. They are included as part of your PRWeb wire service fee. In the case of Newsforce, a partnership with Business Wire will give it quite a bit of visibility pretty quickly. Beta testing of the Newsforce toolset begins this week. As with web page optimization, there is not such thing as automatic SEO with any kind of tool. i.e. 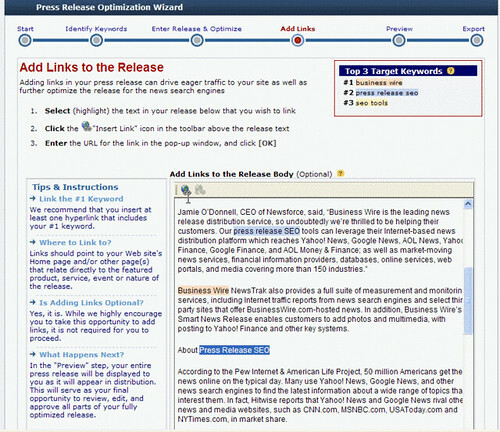 neither PRWeb’s SEO Wizard nor Newsforce will automatically optimize your press release for you. They will however, offer some interesting integration of keyword research, content analysis for optimization and integration with wire services. Newsforce also promises some better press release metrics as well. Will tools like Newsforce make manual press release optimization obsolete? We’ll have to wait and see. On the topic of press release optimization, I will be covering the News Search SEO session on Tuesday afternoon here at Search Engine Strategies San Jose over at Search Engine Roundtable and here at Online Marketing Blog.